ThermaCare HeatWraps Review – Is This Product Safe To Use? 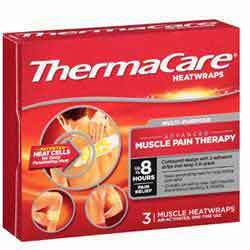 ThermaCare HeatWraps are pain killing, air-activated heating pads that are used in multi-purpose muscle pain therapy. What is the Company behind ThermaCare HeatWraps? What are the Ingredients Used to Make ThermaCare HeatWraps? What are the Pros of ThermaCare HeatWraps? What are the Cons of ThermaCare HeatWraps? Are there any Side Effects associated with ThermaCare HeatWraps? They are made into a countered designed with two adhesive tapes added on either side in order to provide support for the heat wraps. They can be worn in different locations such as the knee, lower back etc. According to the manufacturer, offers deep penetrating heat that helps you deal with pain over a long duration. The idea behind it all is the use of heat therapy to temporarily ease the minor muscular pain, joint aches and other pain associated with joint conditions such as sprains, strains, arthritis, and overexertion. ThermaCare HeatWraps is revolutionary technology that eradicates pain using heat therapy. For this reason, this product is recommended to persons who lead an active lifestyle. Sports people and athletes will particularly find this product to be helpful in soothing sore muscles and aching joints. ThermaCare HeatWraps is available over the counter without the need for the prescription. This means that it can be readily ordered over the internet for a throwaway price. The producers are known as Thermacare. They specialize in making products for heat therapy. What are the Ingredients Used in ThermaCare HeatWraps? How does ThermaCare HeatWraps Work? ThermaCare HeatWraps is made using air activated heat cells made from charcoal. They work by delivering the heat produced to your tissues and providing you with heat therapy. The therapy reduces pain despite temporary. This is achieved through various mechanical processes such as opening up veins to increase blood flow. It can relief muscle cramps and soreness, promote tightness, stiffness without the need to swallow anything. To use the product, you wrap it around your skin right on the aching part. It is advised that you should check your skin every now and then to prevent the heat wrap from burning your skin. The producers warn that this product should not be worn while sleeping. In some instances, it should be worn only on top of clothes to avoid direct contact with the skin. Be careful while using this product since it can cause serious burns when used incorrectly. You should not overlap the heating cells as this might lead to overheating. Do not use it on children or people above 55 years as this adds to the risk of experiencing burns. In case you feel a painful burning sensation, remove the pad immediately and seek help from your caregiver. This product is awesome on paper. It gives you an alternative form of fighting joint pain and soothing sore muscles. All the same, the product doesn’t address the root cause of the pain and the healing sensation realized is not sustainable for large periods of time. Despite the product being unique, we have reviewed other topical analgesics that will give this product a run for its money or you may check some other joint pain relief products.